"Sampath Speaking" - the thoughts of an Insurer from Thiruvallikkeni: will India win (2nd Investec Test) at Lords ... Sir Jadeja to the fore !!! will India win (2nd Investec Test) at Lords ... Sir Jadeja to the fore !!! They said winning the toss is a huge advantage – England managed a slender lead – and at some point of time were at driving seat … Murali Vijay battled with great responsibility and a late assault by unlikely Jadeja and his partnership with reliable Bhuvanesh Kumar ended up India setting England a daunting 319 for victory in the second Investec Test at Lord's. Ravindra Jadeja is in the thick after that charge against James Anderson – but today he made runs – his first 50 in 10th Test – a good innings of 68 off 57 balls. 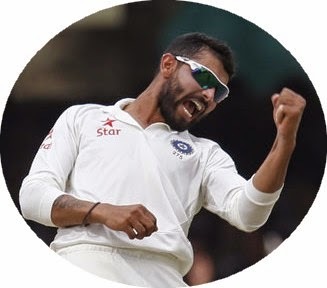 When England opened their innings their 2nd innings – Binny seemingly is not in the thick of things – Jadeja’s spin is… he did get rid of Robson, with his first ball… – has now bowled 10 – most by Indian bowler while Bhuvi has bowled 6 – Ishant on his 8th. Earlier Vijay got tantalising close to a Lord’s century but missed it by 5 runs. Binny was out for nought to a Moeen’s spin ! Bhuvneshwar was dropped by Joe Root at fourth slip early in his innings – commentators stated that he was standing too close ………. And when Jadeja bowled, Dhoni was seen standing quite a few yards behind !! Will India win >?? ?............Ian Bell is out to Sharma – making it 71/3… and as I prepare to post this …. Alastair Cook too out to Sharma .. 72/4; Vijay bowled 3 – Binny yet to..